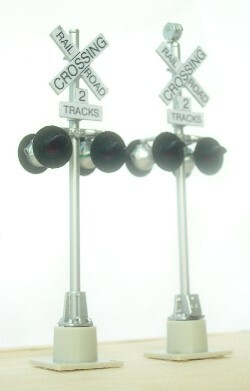 This crossing signal pair are the last of the Custom Signal brand of the 4 headed crossbucks. Quality is almost as good as the Tomar crossbucks. The LEDs appear to have a lens. Same drive board is used for operation. 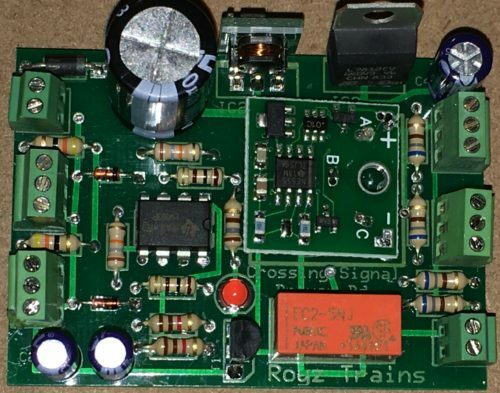 Trigger from board may be IR beam OR isolated track. These come two per purchase. One mast will have the characteristic bell at the top. On the real railroads only one mast of two would have the bell. The signals come with a phone plug that should be cut off. Then a 680 ohm resistor (supplied) is added to the common anode lead and then the wires are connected to the drive board. 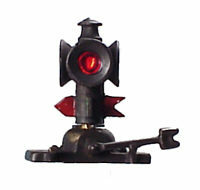 These crossing signals vary only slightly from the more expensive Tomar Crossbuck signals found elsewhere on the Royz Trains site. The quality is a little lower, but still great for prototypical operation. Each light head has a red LED with a focusing lens. 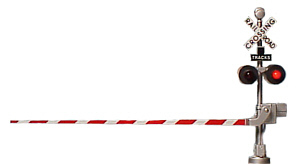 These operate with a common anode for all four LEDs and will work with our signal crossing controller (either IR detection or isolated rail). We also offer a flasher board that provides prototypical flashing of the LEDs and will require a separate 12 VDC supply; triggering is not included.